You may have heard of ZoomLock and LokRing for refrigerant pipe fittings, but have you heard of Reftekk? The Reftekk Bendable Piping Solution is another way to reduce installation labor for Refrigerant piping in a VRF system. Is it possible to eliminate up to 75% of the brazed joints using Reftekk Bendable Piping? 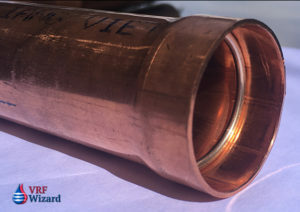 Reftekk piping uses bendable copper to eliminate some of the fittings in a refrigerant system. You will need to use soft (annealed, O60 or R220 Temper) or bendable quality (H55 or R250 Temper) copper tubing. It’s not to be used with hard (H58 Temper) copper tubing. 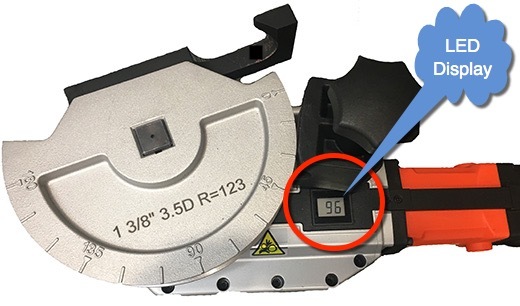 You can bend up to 190 degree angle with the use of the Reftekk Digi-Bender. It’s easy to make precise bends by just scrolling the control wheel until the LED display shows the exact angle you want. Pull the trigger and the machine automatically bends your tube to the required angle set by you. The Reftekk Digi-Bender will bend the following sizes of ACR Type-L copper tubing; 5/8”, 3/4”, 7/8”, 1-1/8”, and 1-3/8”. For the smaller sizes 1/4”, 3/8”, and 1/2” they recommended using the Imperial 370-FH copper tube bender. There is no need for elbows when you use the Reftekk bendable copper system. By avoiding elbows you save time and money. With fewer elbows there are fewer brazed connections, thereby eliminating additional sources of leaks. For each fitting avoided you save at least two brazed joints. If you need to make a tight turn then you might be forced to use a conventional fitting as the Reftekk Digi-Bender uses a long radius bend. This longer radius is beneficial for lower pressure drops, so it’s in your best interest to avoid tight turns. The Reftekk copper tubing is bendable and swageable which per the manufacture can eliminate up to 75% of the brazes in a typical system. That can add up to a lot of saved time and money. There is no need to lug around boxes of fittings when you can make your own out of the straight length bendable copper tubing. One of the differences with the bendable version of this copper tubing is that it comes standard in nineteen (19) foot lengths instead of the traditional 20 foot sections. The ends of the tubing come plugged to keep the inside clean. 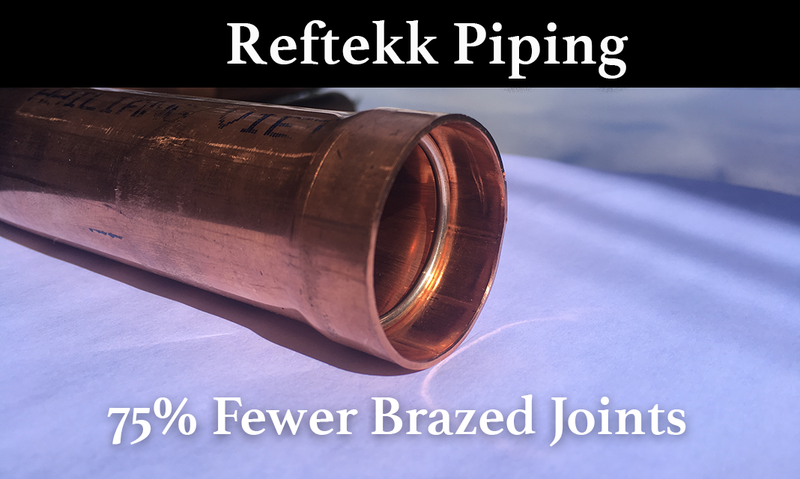 The Reftekk bendable copper tubing is capable of having a swageable connection applied to the ends to avoid having to use couplings. This will reduce the amount of fittings and brazed joints required, eliminating additional leak points and saving you time and money. By avoiding the use of a coupling which requires two brazed connections, you immediately eliminate 50% of the joints required. Less time preparing, purging and brazing. The swage is made with the Reftekk SwageX swaging expander which provides the correct swage depth on the end of any bendable quality copper tubing lengths. 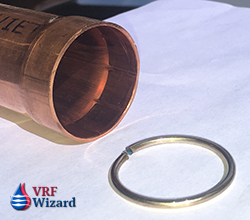 The Reftekk swageable copper tubing uses an internal brazing ring that you insert into the end of the swaged copper tube before brazing. This method provides brazing from the inside-out, as the brazing rings sits at the bottom of the swaged joint. 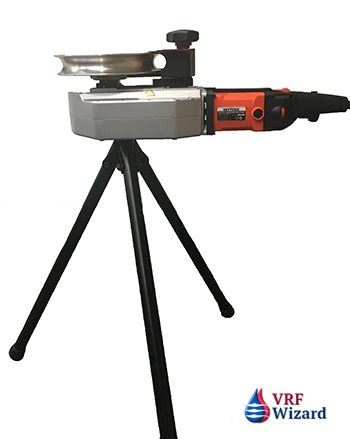 When the joint is heated you will get a visual cue that the joint is complete when you see the brazing ring material penetrate the full depth of the swage and appear on the full circumference of the outer surface. The visual cue helps to prevent you from overheating the joint. There is no guessing on how much filler material to use when you use the Reftekk ACR brazing rings, as each brazing ring is made to provide the correct amount of material for the joint. No longer do you have to keep hand feeding a brazing rod while wondering if you have the correct amount to make a leak proof joint. 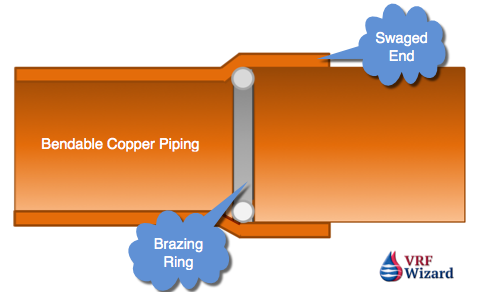 The Brazing ring is comprised of approximately 15% silver, 5% Phosphorus and the rest copper. The melting point of the Reftekk Brazing ring is at 1190 F and flows at 1300 F.
There is no flux needed with the Reftfekk Brazing Rings as the rings have Phosphorus flux built into them. Reftekk recommends that you use Oxy-Propane instead of Oxy-Acetlyne. The Reftekk ACR Brazing Rings come in the following sizes; 3/8”, 1/2”, 5/8”, 3/4”, 7/8”, 1-1/8”, 1-3/8”, and 1-5/8”. Reftekk provides refrigerant ball valves with an optional EPDM insulation jacket in sizes ranging from a 1/4” to 2-1/8”. These ball valves swaged connections that accept the same brazing rings as the pipe tubing. There is a schrader valve built into the brass body of the refrigerant ball valve for easy access. 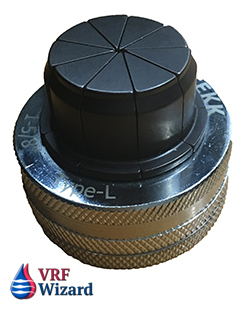 The valve has a maximum working pressure of 700 psig and a working temperature range from -40F to 300F (-40C to 150C). With up to 75% fewer brazes the Reftekk Integrated Piping Solution is a great option to the standard use of fittings, helping you to save time and money while reducing the amount of joints that could potentially leak. You will still need to prepare the joint and purge with nitrogen, but you will have less joints to make. I believe Refteek can save you time and money and should be something that you offer your customers. 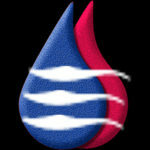 Check out this Reftekk Piping Flyer.